Dr. Sonja Nebel graduated from RWTH Aachen / Germany. She earned her PhD at the same university. Sonja has been teaching for more than 25 years at different universities in Europe and in Arab Countries in the field of urban design, urban planning and urban conservation. Sonja has focused for many years on cross cultural and interdisciplinary scientific research on urbanization and housing, such as: „Urbanization processes and transforming housing patterns“, (Zambia, Bolivia, Thailand), „Informal Housing“ (Syria), „Megacities – Megachallenge: Informal Dynamics of Global Change“ (China). Furthermore, she works as a consultant within the international development cooperation in the field of urban development and urban management, sustainable urban conservation, strategic and participatory planning. Dr. Awni Shabaan earned his PhD at Texas A&M University. He holds a Master Degree from the University of California. Awni taught at various universities from Bagdad to Bahrain before joining Sultan Qaboos University. He is Professor of Architecture with long-standing experience in solar design, climatic modelling with special emphasis on the Environmental Impact on Architecture in Yemen. He has an impressive record of practical architectural projects as well as scientific publications. Dr. Alaa Mandour earned his PhD at Cairo University and holds two Master Degrees from MIT and Cairo University. His academic experience includes teaching courses on architectural programming, design methods and theories, his courses place emphasis on recent developments in architecture and urbanism in different contexts, typological transformations in traditional architecture / urban spaces, sustainable design processes, assessing designed environments from users‘ perspective, and diversity in urban spaces. 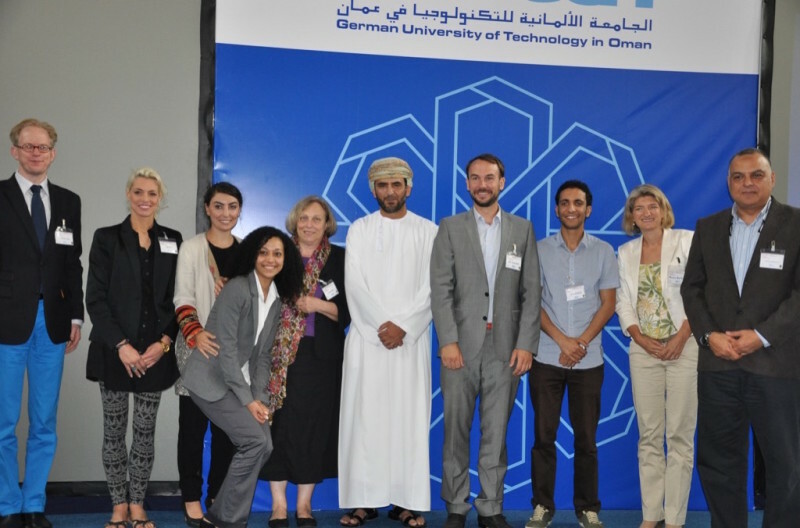 Participants of the conference „Challenges for Urbanization in the Gulf Countries“ held 2014 at GUtech in Oman.